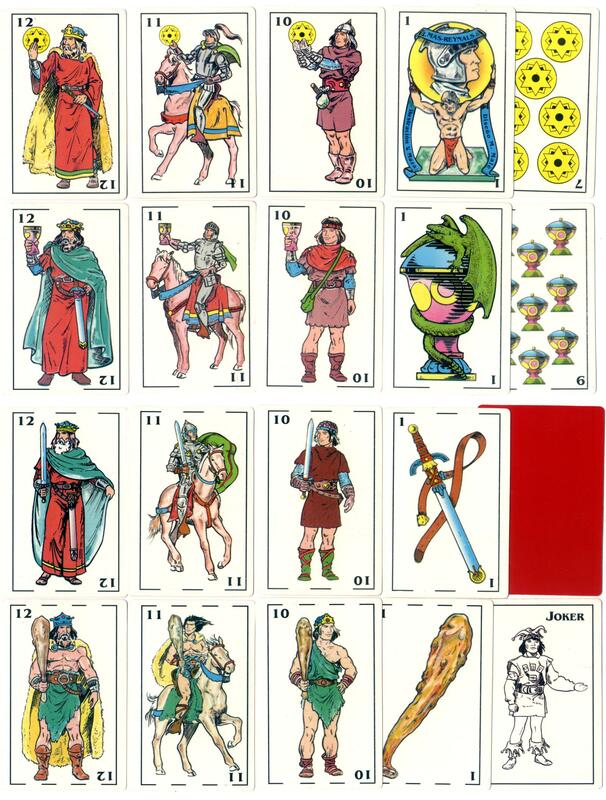 This fantasy Spanish-suited medieval pack of playing cards was published by Mas-Reynals in 1993, designed by M. Malé and illustrated by V. Maza. This follows a tradition amongst many manufacturers of producing a fantasy medieval design. The firm was founded in 1989 by Miguel Mas Reynals and today trades as Varitemas, S.L. producing a range of paper products including folders, albums, playing cards, etc. Earlier decks have the name Mas-Reynals, but today Varitemas S.L. produce a range of decks including Poker, Spanish-suited, souvenir packs, miniature cards and children's card games. Above: Baraja Edad Media, fantasy Spanish-suited medieval playing cards published Mas-Reynals, 48 cards + Joker, Barcelona, 1993. The backs are plain red. 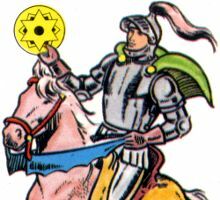 Captions on the Ace of Coins state that the cards were designed by M. Malé and illustrated by V. Maza.